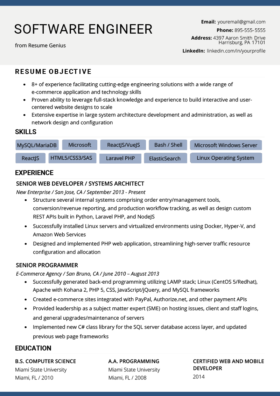 We’ve crafted our web developer resume with the help of tech industry vets. Follow our expertly written tips, and get in front of interviewers. 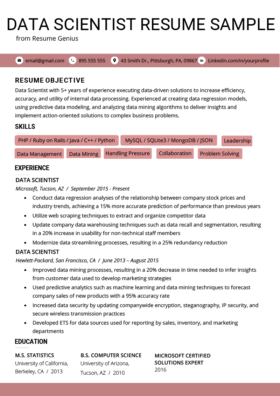 Web Developer with 8 years of experience in designing and developing user interfaces, testing, debugging, and training staff within eCommerce technologies. Proven ability in optimizing web functionality that improve data retrieval and workflow efficiencies. Web Developers are in high demand these days as new online businesses pop up on the web on a daily basis. Having the ability to create websites that are not only user-friendly, but also perform flawlessly is a great sign of a strong Web Developer. Web developers also have to be consistently learning new tools in order to stay on track with the ever-changing technologies. Web developers are experts in their field and need to have a good ability to translate client requirements and specifications into a reliable website. They consistently test and fix issues that arise behind the scenes of the web world and make sure to minimize any down time. Essentially, he’s made a very compact argument for why he’d be a good candidate for the job in a very short amount of space. Now, the hiring manager seeing his resume will be intrigued, and look for evidence of his claims further in the resume. Web Developers should always include any programming language, software, hardware, and tools that they are proficient in. The above bullet point proves that the candidate is thinking about the end product and how to ensure that the company is profitable with the website it has made. Candidates need to create websites that will ultimately make customers want to purchase something. As shown above, one of the most important components of creating something on the web is its security. 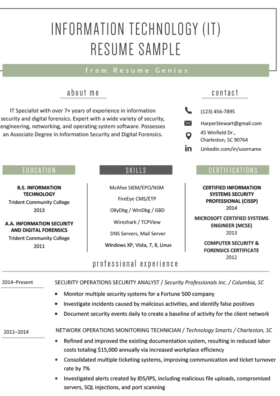 A Web Developer who can ensure web security will be someone who companies will definitely seek. In addition, the candidate quantified the effect of his work, giving the hiring manager a clear picture of his skills. 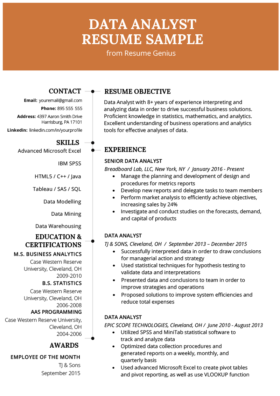 Quantification and targeting are essential components of writing a resume. Here, the candidate lists some of the technical skills he possesses. Web Developers should always include any programming language, software, hardware, and tools that they are proficient in, so that Hiring Managers can immediately see whether the skills they require are met with the Web Developer’s experience. What parts of your professional experience make the strongest case to interview you? Be sure to think on it, and do research before writing your resume. If you wish to save time, Resume Genius’ software provides built-in professional resume templates and phrases to assist you in building a resume.